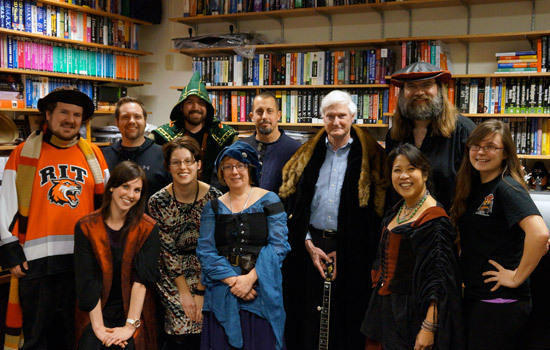 Faculty helped students explored the campus and prepared for winter in a Game of Thrones themed scavenger hunt Dec. 19, as part of a Just Press Play achievement. 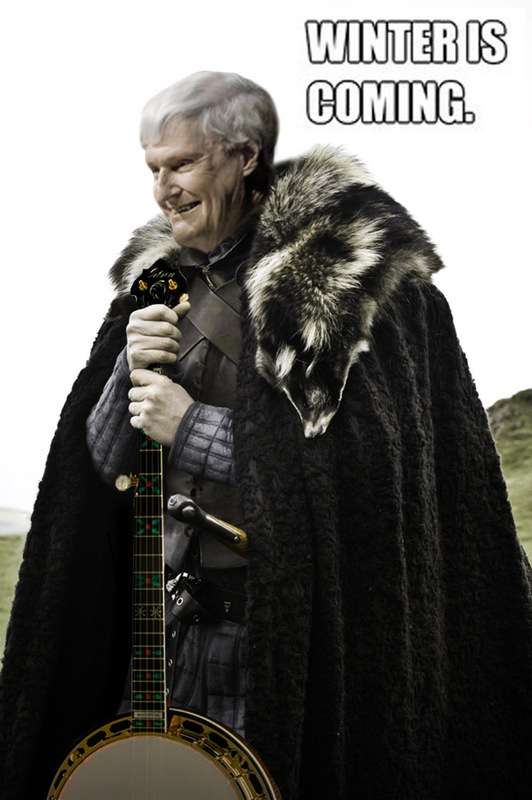 Brace yourselves; winter is coming to RIT. 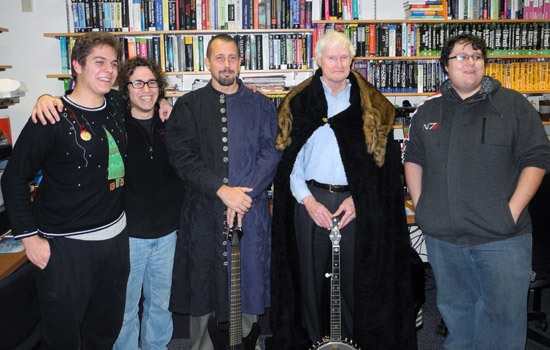 Donning “House RIT” robes and wielding his trusty banjo, RIT President Bill Destler filled in as the “King of Games” for Run the Gauntlet: Winter is Coming, a Game of Thrones-themed campus-wide scavenger hunt on Dec. 19. By completing the gauntlet, students gained an achievement for Just Press Play, the Microsoft-supported project that aims to increase student engagement and exploration through the application of game elements over the student experience. The achievement system is currently available to students in the School of Interactive Games and Media. The hunt sent 46 students across RIT’s campus and back to Golisano Hall, providing them with tips for getting through a Rochester winter along the way. Riddles included, “You will find safe underground passage here to the House of Liberal Arts,” (tunnels to Liberal Arts Hall), “Here lies the home of the Tigers,” (Ritter Arena) and “Diggin’ the scene with books and beans,” (Java Wally’s). After each team made it past several checkpoints, they were met with the final clue: “Where is the Throne of Games?” Students immediately knew to make their way to the School of Interactive Games and Media office, and were pleasantly surprised to find Destler and professor Andy Phelps recreating the popular “Winter is Coming” meme. Last year, students participated in a similar scavenger hunt for Just Press Play, exploring art across campus. Just Press Play hopes to host more achievements that explore museums or the best place to get wings in Rochester. The Just Press Play project, which began in 2011, has continued with additional support from Microsoft in the form of both an additional gift to RIT, as well as internal support from their product divisions. Students explored the campus and prepared for winter in a Game of Thrones themed scavenger hunt Dec. 19, as part of a Just Press Play achievement. 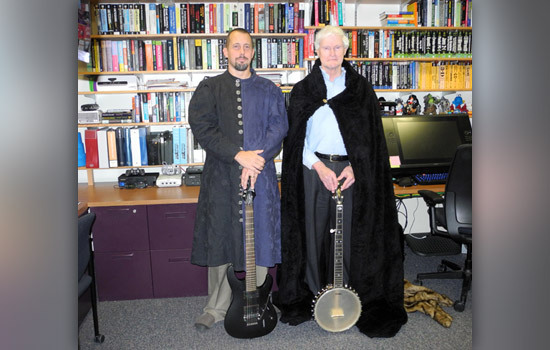 RIT President Bill Destler helped out in the Game of Thrones-themed scavenger, recreating his look from the popular “Winter is Coming” meme. Here he stands with professor Andy Phelps.